Make that 10 total national championships for Katelyn Tuohy. The accolades just keep coming for the North Rockland (NY) junior. Heavily favored once again heading into this one, Tuohy led every single lap except the first, allowing the pack to stay in contact, but not enough to break the superstar. Cruising through the tape in an indoor personal best and meet record 9:51.05, she looked unfazed. In fact, if a kick was made in the final lap, we were certainly fooled as her last lap ended up being her seventh fastest. Tuohy won't be back for the Mile and has ended her junior year indoor campaign with two more national golds for the trophy case. Watch for her to continue to add to that collection this spring. 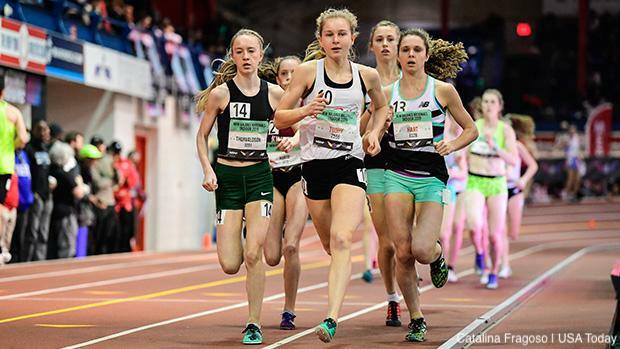 Glenbard West (IL)' Katelynne Hart also crossed the line under 10:00, recording her first such mark on the indoor track with a 9:58.42 clocking. Rawlins (WY)'s Sydney Thorvaldson continued her impressive indoor campaign with a third place finish in 10:01.52. Another Hart impressed in the boys race. This time it was New Jersey's own Devin Hart. 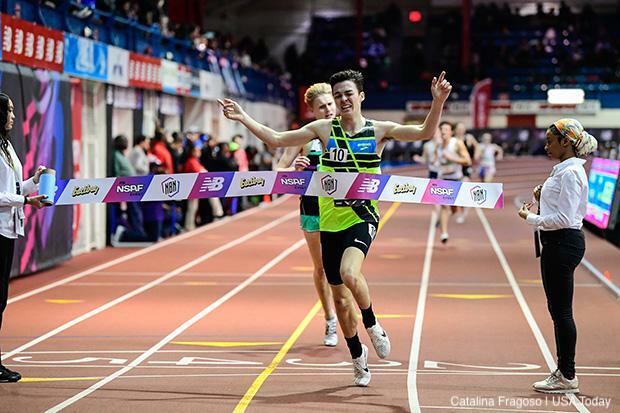 In a tight race in which the lead traded back and forth several times, Hart was able to hold off Arlington (MA)'s Ryan Oosting in the final stretch to take the 2 Mile crown in an indoor personal best 8:56.89. Oosting would finish in 8:57.37, just a few ticks ahead of his indoor personal best, and Bolles (FL)'s Charles Hicks took third in a lifetime best 8:59.81.